Some homeowners believe treatment for mice is necessary only in winter, because that is the only time they enter a home. The truth is, mice and other reproduce all year long, and proper control measures during the spring, summer, and fall are necessary. 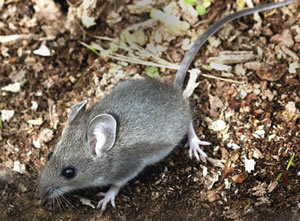 Two mice have the reproductive capacity to create 2,000 mice by the end of the year. They eat human food and contaminate it with urine and excrement. They gnaw into materials such as paper, books, wood or upholstery, which they use as nesting material. They also gnaw on plastic, cinder blocks, soft metals such as lead and aluminum, and wiring which may cause a fire hazard. They spread many diseases, as do the parasites they carry (such as fleas, mites and worms). Getting rid of mice usually requires professional attention. Although home treatments may temporarily eliminate the problem, we highly recommend you call Pest Solutions 365 as soon as possible so we can permanently get rid of the pests. Place all dog food, cat food, bird seed and grass seed in tightly sealed plastic containers. Remove clutter from your garage, basement, or shed. Mice do not like to be seen. The more clutter, the more comfortable rodents feel.